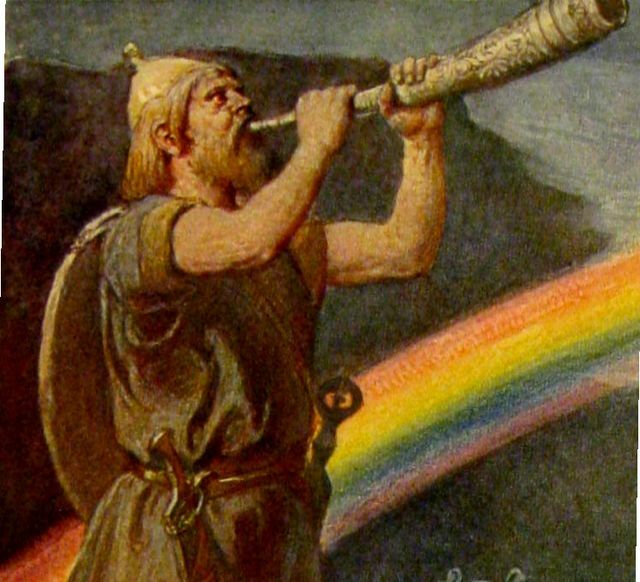 Heimdall at Bifrost by Emil Doepler. I have a message for humanity from Heimdall. Let me first explain how I got this message. While I’ve been writing my novel in progress Some Say Fire, I have sometimes gotten flashes of UPG. This year I’ve been spending close to full-time-work hours open to the gods, thinking about them, devoting my time and energy to them, inviting them into my mind if they have anything to say. I feel that sometimes what flowed out of my fingers while I was writing was inspired by the gods. Out of thousands of hours of being open to them, I got perhaps a few minutes of actual messages, so I’m not claiming to be any better at receiving their messages than anyone else. I just happened to be able to spend the time doing it because I’ve writing a novel based on heathen mythology. When I received this message, it was in the form of a story that fits into my novel. I’m going to quote the message, and then analyze what I think the message means, and then present some information that could be used to follow the message if one wishes. Thor and Loki walked to the Rainbow Bridge. The rainbow lay melted on the ground like an oil slick on a puddle. The puddle shimmered over a green field full of little white flowers and what looked at first like hail lying in the meadow. When they got closer, they saw the hailstones were the curled up bodies of animals. Humans are misusing the Bridge and it’s putting a terrible strain on it. He wants us to stop. There is a poem circulating that encourages people to imagine their dead pets waiting for them at Rainbow Bridge, to join them when they die. There is power in human imagination, especially when many people focus powerful emotion on the same image. Grief is a powerful emotion. The Rainbow Bridge, Bifrost, is for traveling over, not camping on. It is not supposed to be an afterlife destination but a way to go places, including afterlife destinations. Most of the people mentally sending their dead pets to wait for them at Rainbow Bridge are not even heathen. This is not just a matter of cultural appropriation of the imagery of the Bridge. It’s actually affecting the Bridge itself, putting a load on it that it can’t handle. If we break the Bridge, we break the afterlife, and it will lead to Ragnarok. The Bridge is Heimdall’s concern as its guardian. In my opinion, there is an additional concern that may be of interest to non-heathens: if you do not expect to go to Asgard when you die, and you send your beloved pet to wait for you on the Bridge to Asgard, he will be waiting there for you forever. Forever, looking down the road and waiting to run to you wagging his little tail, until the universe collapses in fire or ice, while you went somewhere else. Please stop doing this, everybody. If you want your animals to go to appropriate heathen afterlife destinations, it would make the most sense to visualize them going to the god associated with that specific type of animal. The following list contains both European and American animals because it is derived not only from Icelandic, English, and Germanic / Continental traditions, but also from Urglaawe, the Pennsylvania Dutch tradition. It is not a complete list of all known animal associations and animal forms of the heathen gods, but an attempt to include all possible animals that one might conceivably keep as a pet, livestock, or personally owned performing animal. Visualization has power. It’s good to be sure what one is visualizing is really what one wants to accomplish. If readers have anything to add to the list of gods and animals, please add them in the comments. I loved this! The aforesaid sentimental “poem” is everywhere and is read aloud at animal lovers’ gatherings (one I know of releases helium balloons while the R.B. is read over a loudspeaker, thus creating double pollution). As a longtime animal rescue worker and horse owner, I’ve said farewell to too many of my shorter-lived fellow creatures and I believe that their spirits may go a variety of places. Some stay with me for a while, or return in another form. They are never truly gone, but have entered a stream of life on other levels of existence, somewhat like Ralph Waldo Emerson’s Over-Soul, derived from the beliefs of Emmanuel Swedenborg and influenced by the Bhagavad Gita and the Vedas. Now, certainly Emerson never said that our pets jump up and into the Over-Soul flying about overhead, but we might do well to think of the spirits of all living things in this way. Thanks! Returning in another form is a definite possibility, too. I’d never heard of the poem that triggered this story, but in my experience Gods are myth makers and storytellers themselves, and change tales according to the needs of the occasion, just as humans have done for ages. The literal truth isn’t what it’s about, and I don’t take this story literally. Stag – I have seen Nodens, the ancient form of Odin, as a great, extinct giant stag more than once. And I’ve experienced him associated with Elhaz. Snake – Skadi, according to Snorri. The butterfly for Sigyn has been repeated enough by completely separate parties that it should be a part of modern Heathen lore. Rooster also goes with Frau Holle. Informally, I’d associate Loki with raccoons based on personality. But that is neither lore nor UPG, just an observation about cleverness. Otter, too, since he slayed Otter and had to pay the ransom, and Otters are clever and fun-loving. But I don’t know that I’d use them in altar or worship for him, given the myth’s dark overtones. I would think people would ask Earth Mother to care for their pets. Im not sure what bothers me the most about this post, the idea that humans in their grief are causing a problem on Bifrost that the Gods cannot handle or the critiquing of a persons grief according to anothers standards. Once again the Pagan community is boisterous, lacking in compassion, insensitive and uppity. Gee isnt that something new.